Our "Parting Shots" should happen (almost) every Friday. If only life we're that predictable (along with topics of some remotely relevant, timely nature...let alone succinct, meaningful, actionable, you get the idea). So, here is a parting shot to ponder on a Saturday instead: just imagine the transformation of the global public Internet managed by a multi-stakeholder collective of non-profit organizations with a 30+ year track record... into a brand new government controlled and managed resource in the bureaucratic hands of the United Nations, parked in a political backwater called the International Telecommunications Union ("ITU"). Sure, on a first bite, that seems like a really big fat hairy complicated concept without a clear indication of which way would be better, right? And what's more, the relevance to digital business and marketing seems even more fuzzy, yes? So, its probably a bit obvious we think otherwise, and now we're going to raise your awareness on something that actually could directly affect you (or at least your business mandates). This is on the verge of happening. No joke. And so alarming is this development, that the U.S. House of Representatives is holding a hearing next week to examine the initiative to create regulatory authority over the Internet in the hands of the United Nations, which could be put to vote in a U.N. gathering next December in Dubai (about 6 months from now). Let's be crystal clear here: The proposal, backed by China, Russia, Brazil, India and other UN members, would give the UN’s International Telecommunication Union (ITU) predominant control over the governance of the Internet. The United Nation's ITU counts over 193 member countries (several whom are not exactly in favor of freedom of speech, democracy, or human rights) and all get a vote in the matter. The initiative would expose the Internet to top-down regulation crafted by national governments at the table, but without the rest of the stakeholders. This means negotiations over all aspects of the architecture, technical operations, policies and regulations of the Internet would be conducted within the constructs of political negotiation by and between ITU member representatives of governments, with very limited access (let alone any voice) for non-government entities or individuals or other observers. "Not only is the about preserving the Internet as one of the greatest tools of democracy (think: an Arab Spring without Twitter), but the immense fragmentation that would occur covering all technical aspects of how the global Internet works would almost guarantee its collapse as single global infrastructure that is enabling so much of the 3rd (digital) age." Impose unprecedented economic regulations such as mandates for rates, terms and conditions for currently unregulated traffic-swapping agreements known as "peering;"
Regulate international mobile roaming rates and practices (impacting the emerging backbone of global Internet activity: wireless devices). On the other side of this, many countries in the developing world, including India and Brazil, are intrigued by these developments. Even though Internet-based technologies are improving lives of hundreds of millions globally, some governments feel excluded and want more control. The real issue here that we wrote about indirectly once before, is that strong-arm regimes are threatened by popular outcries for political freedom that are empowered by unfettered Internet connectivity (again, think "Arab Spring"). These governments have formed impressive political coalitions to support this initiative, with their efforts progressing rapidly now leading up to December in Dubai. We note further that last June then Russian Prime Minister Vladimir Putin, stated that his goal (and that of his allies) is to establish "international control over the Internet" through a treaty-based organization under U.N. Recent Map of the Global InternetLet's back up a bit. Since the Internet's birth in the '50s, academics, engineers, scientists, researchers, user groups and interested individuals have convened in bottom-up non-governmental organizations to keep the 'Net operating and thriving through what is known as a "multi-stakeholder" governance model. In our opinion, this consensus-driven private-sector approach has been essential to the Internet's incredible growth and success. And the U.S. government agreed in the mid '90s when they decommissioned the National Science Foundation's NSFNet and turned over management of large portions of the Internet's routing infrastructure to private entities which allowed unrestircted commercial traffic on board. If successful, this new regulatory proposal would quash the Internet's flourishing regime, which has been in place since 1988. That year, delegates from 114 countries agreed to a treaty that enabled liberalization of international telecommunications. 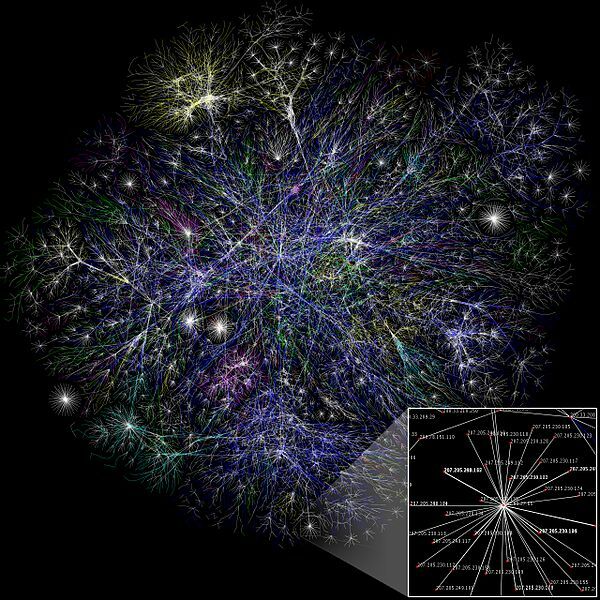 This insulated the Internet from economic and technical (politically directed) regulation and quickly empowered it to become the greatest communications revolution since the advent of the telephone. As Vint Cerf, one of the "fathers of the Internet" and Chief Internet Evangelist for Google wrote in a New York Times Op-Ed this past week, "The Internet prospered because governments (for the most part) allowed the Internet to grow organically, with society, academia, the private sector and voluntary standards bodies collaborating on development, operation, and governance." In contrast, the I.T.U. creates terrible barriers to public participation. This is an agency of the United Nations that grew out of the International Telegraph Union established in 1865. A treaty governing the agency, last amended 24 years ago, established practices that has left (until now) the Internet largely unaffected. Now, some have suggested that the perception the U.S. wields far too much influence and control over the development of the Internet has been the catalyst for smaller nation members of the I.T.U. pushing for this initiative. And yes, this does affect all of us who are trying to advance the potential of the Internet as an instrument of business and commerce. In 1995, shortly after the Internet was moved from its government infrastructure to commercial infrastructure, some 16 million people used the Internet worldwide. By 2011, more than two billion were loging in... and that number is now growing by half a million per day. Today, Internet access through mobile devices is fundamentally changing lives more quickly than any other technology in history. Nowhere is this more true than in the developing world, where unregulated Internet technologies are expanding economies and raising living standards. More locally but with global implication, one of our C[IQ] partners is working on a project wherein local farmers are now able to find local buyers for their crops through their Internet-connected mobile devices. And as we mentioned already, advocates of political freedom are able to share information and organize support. Why it might matter to all of us: A recent McKinsey study produced a surprising insight... so shocking that we believe it has played a role in keeping our own Congress in check when thinking about Internet regulation. That study indicates that for every job disrupted by Internet capabilities, 2.6 new jobs are created. Here's our bottom line: Demolishing a model of innovation that has allowed the global Internet to grow and postiviely impact society in the unprcedented manner it has, in favor of a top-down regulatory scheme implemented by political process, will kill the Internet as we know it. It would impair Internet growth globally as technologists are forced to seek bureaucratic permission to innovate and invest. This would also undermine the proliferation of new cross-border technologies, such as cloud computing. No intergovernmental body or agency can make engineering and economic decisions in Internet time as we come to know it. Productivity, rising living standards, and the spread of freedom everywhere would grind to a halt as engineering and business decisions become politically paralyzed inside a global regulatory body. So, what can we do, if anything? Well, it turns out, the U.S. has not named a leader for the treaty negotiation in Dubai. Yes, a Congressional inquiry is underway as we noted at the outset, but that's not enough. As with the groundswell uprising required to stop the SOPA legislation earlier this year, again we must rise up and fill the inboxes of our Congressional leaders with our messages of concern. We really do not believe it is alarmist to suggest that the notion of the United Nations assuming regulatory authority over the global Internet has the potential to affect the daily lives of all Americans. It certainly can and will impact if not derail your business interests locally and globally. And that's our parting shot for the week.